Shin splints can be used to describe a ‘catch-all’ of lower leg pains, but is most commonly known as medial tibial stress syndrome (MTSS), which is defined by the American Academy of Orthopaedic Surgeons as a "pain along the inner edge of the shinbone (tibia)". Shin splints come about from repeated trauma to the connective muscle tissue surrounding the tibia and is a common injury affecting athletes who engage in running sports or other forms of physical activity, including running and jumping. 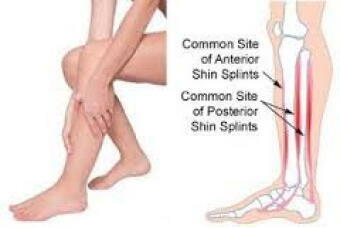 Shin splints are characterized by general pain in the lower region of the leg between the knee and the ankle. Gradually increase the intensity and volume of your activity. Stretching of the calf and shin muscles - Addaday's Prostretch can be used to stretch and strengthen the shin muscles. If running on a cambered surface, alternate sides to relieve pressure. If running on a track alternate direction of running. If caused by overpronation, wear a stability shoe or an insert such as Superfeet to provide additional support to the foot. Wear a compression sock or sleeve such as CEP.